Home → Justices Biographies → Blair Moody, Jr.
Blair Moody, Jr. was born on February 27, 1928, in Detroit, Michigan. He attended public schools in the Washington, D.C. area where his father served for many years as a writer and as Washington bureau chief for the Detroit News, and later as United States Senator from Michigan. Moody attended the University of Michigan, working during the summers as a reporter for both the Detroit News and the Washington Post. He received his A.B. degree in 1949, and his LL.B. degree in 1952. Moody married Mary Lou Kennedy on August 18, 1951. Upon graduation from law school, he served on active duty in the United States Air Force during the Korean War. After his release from military service, Moody returned to Michigan and entered private law practice in Detroit. He was first an associate, and later partner, of Robert A. Sullivan, Rex Eames, William B. Elmer, and William J. Petrillo. Despite the heavy demands of his law practice and the strong commitment to his family life, he nevertheless took an active role in the Democratic Party at all levels. He was particularly proud to have served as Chairman of “Citizens for Kennedy” during the 1960 campaign. 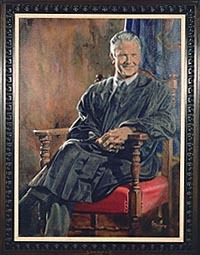 Moody was elected to the Michigan Supreme Court in November of 1976. He was most strict on decorum, and he believed that the conduct of persons in court should be the same as the conduct of persons in church because the adjudication of rights, to him, was a sacred matter.